To climb the dunes, you must be able to withstand constant sand-blasting winds blowing in different directions. The sun’s rays blare down like a mirror to the dunes, heating up the sand like fire. To get an idea of the wind and sand blowing, check out this playlist of three short video clips I created. Reaching the top of the tallest dune and watching the sunset makes every step worth the hike. 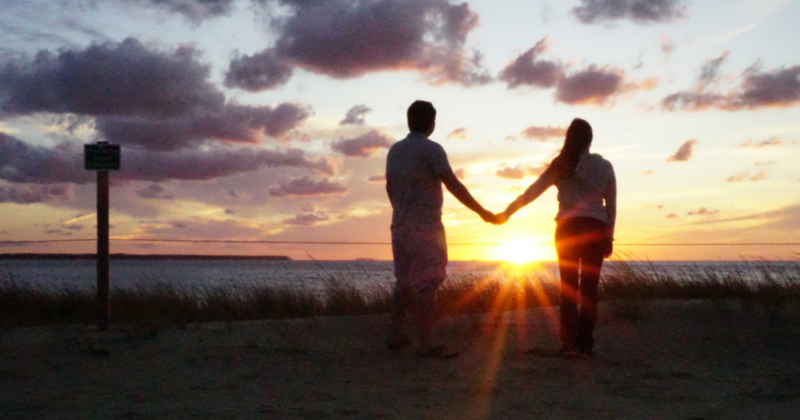 To take advantage of the killer sunset view, allow enough time to trek to the top of the dune. You can also see quite a show when you walk past the dunes and stand in front of the sound. Not into hiking? 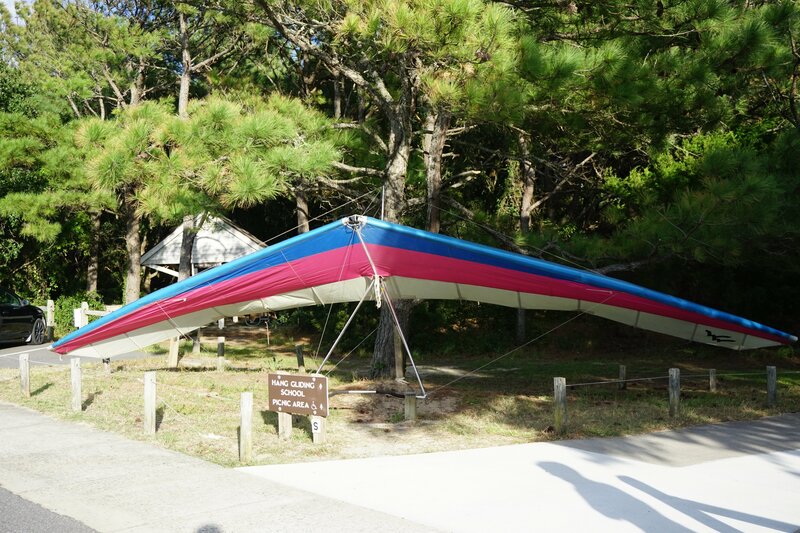 Adventurous souls will love hang gliding. You can even take your snowboard and use it as a sand board to fly down the dunes throughout most of the year. How cool is that?! I will definitely be trying that if I ever go back during the allowed times (I only missed it by one day😩). 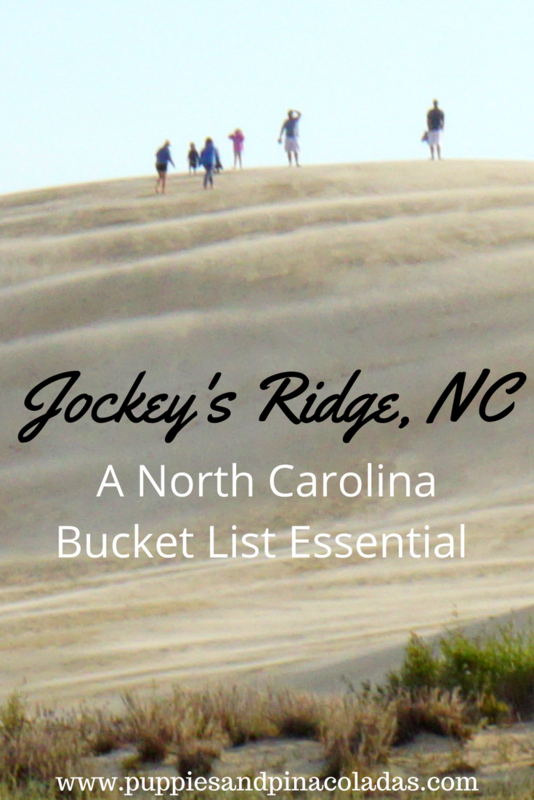 Jockey’s Ridge is one of the most photogenic places I have seen in North Carolina. 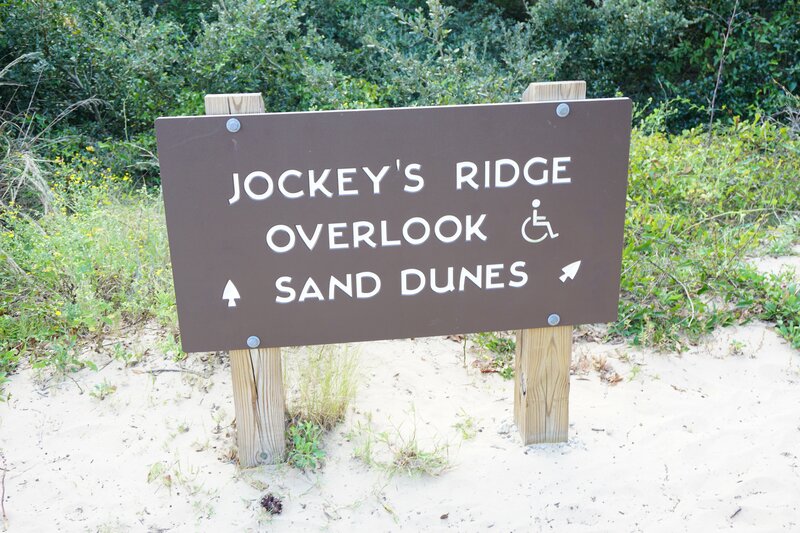 Since my husband and I had decided on The Outer Banks for an anniversary trip, I knew I wanted to head to Jockey’s Ridge for pictures. When packing for the trip to the Outer Banks, my wedding dress stood out to me in the closet. I thought about how ridiculously expensive wedding dresses are and how much I loved my dress. Immediately I knew I must pack the dress and take pictures with it as a way to celebrate our anniversary and remember the trip. I prepared myself for weird looks and questions from strangers. Most people do not dress in formal wear to head to a sandy and treacherous outdoor park. However, I guess the desire to be in that dress again, blowing in the wind and bringing back magical wedding memories outweighed my hesitations. We walked around the entire park (with LOTS of sunscreen), super early in the morning. I had a blast twirling around in my wedding dress in the wind and I would do it again in a heartbeat! Since my dress is blush pink, no one asked me if I was getting married and I was thankful. I didn’t want to explain my crazy idea for wearing my wedding dress three years after getting married. Now I can happily put my dress back in the closet (after a good cleaning) and know that I got a little more bang for my buck, and some fun pictures. And who knows – maybe I will bring it along on the next anniversary trip (sorry honey)! Shoes: Please wear shoes! Even when I walked around barefoot during cooler hours, I stepped on several sand burrs (OUCH!). The burrs were not in plain sight on my path and I am still feeling the pains from where I couldn’t get part of the prickly part out right away. Sunscreen: Sunscreen is a must for the brutal sun. Avoiding the sun is nearly impossible once you are in the middle of the sand dunes. Hat: A hat helps tremendously with shielding the sun and wind. Make sure the hat is secured very well or it will blow away in the wind. Scarf: I thankfully packed a lightweight infinity scarf in fear of getting cold from the wind. While it helped with that, I was most thankful for the sand blocking abilities! Bonus points for a sheer scarf so you can cover your entire face and still see where to walk. 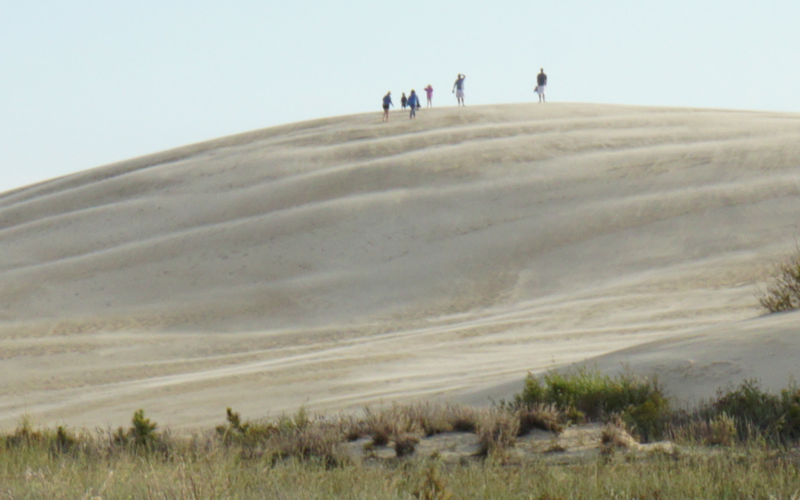 View: Try to plan your visit to make the hike to the top of the dune by sunset for incredible pictures. Kite: Most people fly kites at the tops of the dunes. Don’t miss out! There are kite stores nearby.